Stuffed peppers were a staple in my house growing up. We would have them at least twice a month. I always liked them. Although as a kid you don't realize how much you like something until you don't have it anymore. I miss eating them because I really don't make them that often myself, mostly due to the fact that they take a while to prepare. Also, I don't really eat much ground beef anymore either. So I got to thinking... Why not come up with a quicker version and lighten it up a bit. I decided to use my usual substitute for ground beef - ground turkey of course. Plus I cut the amount in half and added some healthy fiber filled lentils in its place. And instead of using white rice which is not all that healthy, I used brown rice which has more nutrients and fiber. Ok now, let me tell the best part of all. The time savers and my two new best friends... Joe and Ben. 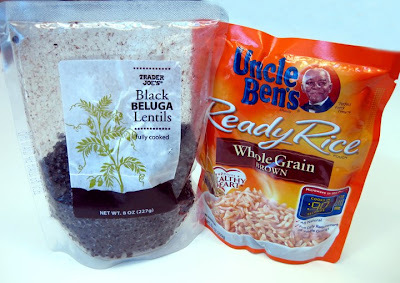 That's Trader Joe's lentils and Uncle Ben's ready rice. By using these pre-cooked ingredients, I saved so much time. And they are just as healthy as if I cooked them myself. 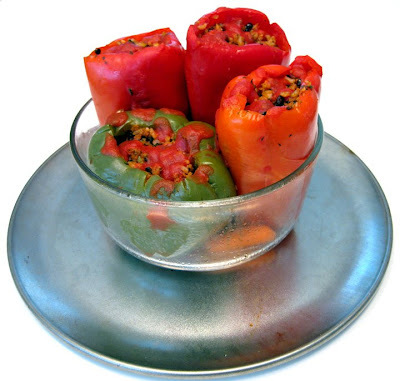 So I hope you give these healthier stuffed peppers a try, they won't take all day and you will be happy that you ate such a nutrient rich and satisfying meal. Also, just a note on pepper shape and size. When I bought the red bell peppers, I wasn't thinking about making stuffed peppers because I would have bought short, wide ones if I had thought about it. Because they were so tall and thin, I had a problem standing them up in my usual baking dish. So I improvised and put them in a oven safe pyrex bowl and placed it on a pizza sheet pan just in case anything dripped or oozed over and out of the peppers. It worked out just fine and it looked kind of cool too! Cut tops off bell peppers; discard tops, seeds, and membranes. Steam peppers in a steam basket in a large pot of boiling water for about 7 minutes (until crisp tender) or cook in boiling water 5 minutes; drain and set aside. Add olive oil, shallot and garlic to a dutch oven or large skillet, sprinkle with a little salt and cook over low heat until softened. Raise heat to medium high and add turkey, stirring to crumble. Cook until liquid evaporates and turkey begins to brown and the bottom of the pan has developed a brown film. Stir in brown rice, lentils, olives, chicken seasoning, oregano, parsley, salt, pepper, worcestershire and 1 can tomato sauce. Using a wooden spoon, scrape up the brown bits on the bottom of the pan and cook around 5 minutes, stirring frequently. Turn off heat and add Romano cheese; stir to combine. Divide turkey mixture evenly between peppers, and place them in an 8-inch square baking dish or oven safe round bowl; top with remaining can of sauce. Sprinkle each pepper with a little extra grated Romano cheese. Bake at 350° for 30 minutes. Serve with extra Romano cheese. I love how you shortened the cooking time. I buy the lentils from TJ's all the time. Oooh those sound very good. You make the food that I like to eat! This looks great! I make a lentil and rice filling for a vegetarian alternative to cabbage rolls. you know what's great about this?? 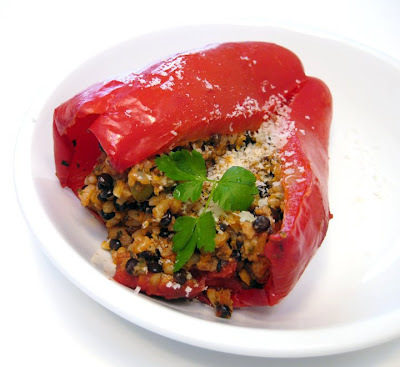 i have those lentils and rice pouches in my cupboard, i love stuffed peppers, and i may just have some ground turkey in my freezer somewhere! :) sounds like i'll have to try these out soon! !